Buried in Paul Krugman’s column today was an interesting fact, of which I was not previously aware: As a result of action/inaction by President Obama, the income tax rate paid by the top 1% of earners is back up to where it was in 1979, before President Reagan took office. Weirdly, upon reading the above, my mind jumped to a fundamental change which appears to have happened in the economy since the crash of 2008-9: Single-family home starts cratered and have so far failed to recover to “normal” levels. Note that starts remain very low by historical standards. And, because homebuilding represents something like 3-5% of GDP, this failure to return to “normal” levels causes real harm to the economy. The question is: Why is this the case, particularly since Millennials have begun reaching the prime home-buying age? But what if it’s a taxation issue? Small developers are typically organized as LLCs, which are pass-through entities for the purposes of taxation, meaning that they pay personal income tax on their profits. 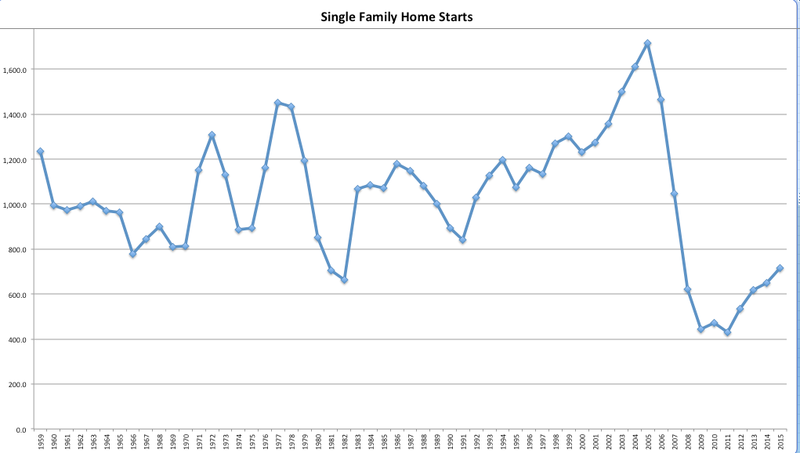 Homebuilding is an extremely risky business (as demonstrated by the recent crash). It would not surprise me if a substantial portion of the smaller homebuilders who know how to do the business are looking at the balance of risk and (post-tax) reward and deciding to spend their time doing something else.